Woodland Park Zoo Blog: Flying penguins? Well, yes, the nine penguins that will soon call the new Humboldt penguin exhibit home did fly here, but by way of airplanes, not their own power. Five females and two males arrived yesterday afternoon from SeaWorld San Diego and St. Louis Zoo. 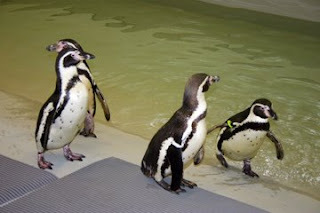 They join a pair from Aquarium of Niagara that arrived earlier this week and 11 more penguins arrive later last night from Brookfield Zoo and Rosamond Gifford Zoo. The 10 penguin pairs will be quarantined for 30 days before they waddle out into their brand new exhibit for the first time. The penguins arrived at the airport in “kennel cab” style dog crates, safely screened to keep them calm. Zookeeper Celine Pardo and I loaded the crates into the zoo’s van and whisked them to the zoo and the off-exhibit area constructed for them behind the new exhibit. One-by-one we opened each kennel at which time a penguin head poked out, wondering where they were. Like the penguins, we didn’t know quite what to expect; despite their seemingly comical personalities, penguins have powerful beaks and can deliver a painful bite! But fortunately, they all seemed rather non-plussed by their trip and waddled out of their kennels. Each penguin came with a band on one wing that identified them. We removed those and replaced them with our own colored-coded bands, weighed them and then released them into the room to meet their new exhibit mates. Invariably they were greeted penguin-style with bowed heads and outspread wings. For one penguin this was a homecoming of sorts. “Radar” a female, had been hatched here at Woodland Park back in 1993. She left to join the penguin colony at the Columbus Zoo and then the Saint Louis Zoo and now returns to her point of hatching. The new arrivals are settling in very well and enjoy swimming in their pool, awaiting the day that the new exhibit opens on May 1 for the zoo member preview day and May 2 for the public. (Photo top: The newly arrived gang gets acquainted before a dip in their lap pool. You said, "new exhibit opens on May 1 for the zoo member preview day"
Is that paying support members? Yes, the May 1 preview day is being offered to those who hold current, paid zoo memberships. May 2 will be the opening day for ALL zoo visitors. Hope you can make it to one of the openings! Very exciting--but what happened to the penguins that were in the previous exhibit? 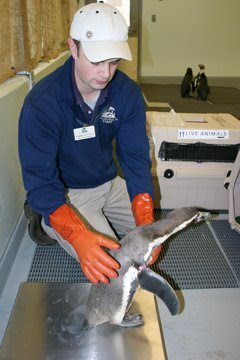 The penguins in the old exhibit moved to other zoos and joined new colonies when the exhibit closed last year. Good job going the extra mile and giving me the membership link! I'm buying one now. Had you not given the link, I wouldn't have considered it. With our son turning 3 in a couple weeks, we'll be visiting the zoo at least a couple times this season and bringing family. Nice post Shawn. Your "hands on" view point brings the life of WPZ Humboldts into focus in a very entertaining way. How well I remember helping to raise little "Rotundo" in the 70's at the Zoo. There is nothing like the smell of herring thawing to inspire you in the morning. Have you guys figured out a way to get the fish scales of your hands and arms. I always found it a little disconcerting when later, say at a date, I would see one fall into my soup. So many memories. I think I still have a few permanent marks on my fingers where Rotundo used to chew on them with his sharp little beak. Ain't being a Zoo-Keeper grand!